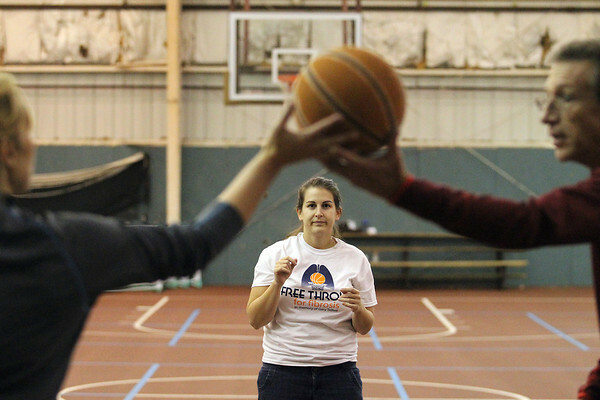 Melanie Catinella (cq) of Traverse City waits to shoot another basket as her helpers Rachel Truelove-Tedham (cq), left, and Larry Truelove (cq) rebound for her during Saturday's Free Throws for Fibrosis to raise money for the Pulmonary Fibrosis Foundation at the Grand Traverse YMCA. The condition causes thickening and scarring of lung tissue, making it difficult for the lungs to transfer oxygen to the bloodstream. The event was held in memory of Gary Talbot, an avid basketball player who passed away in April this year. "What better place to do it than the place my dad played at," said Lisa Talbot, Gary's daughter. "He was a big basketball guy." Thirty-one people participated, many collecting pledges ahead of time based on how many free throws they could make out of one hundred attempts. Close to $12,000 was raised.